Why Is Pickled Ginger Traditionally Served With Sushi? Fried, whole bullfish makes a great centerpiece. 2 Why Is Pickled Ginger Traditionally Served With Sushi? Bullhead fish, also known as catfish, are found throughout the United States and usually eat from the bottom of their habitat. This can cause the fish to have a meat that requires seasoning as it has a distinct taste. Frying the fish is one of the best means of cooking it adding texture and flavor to the meat. 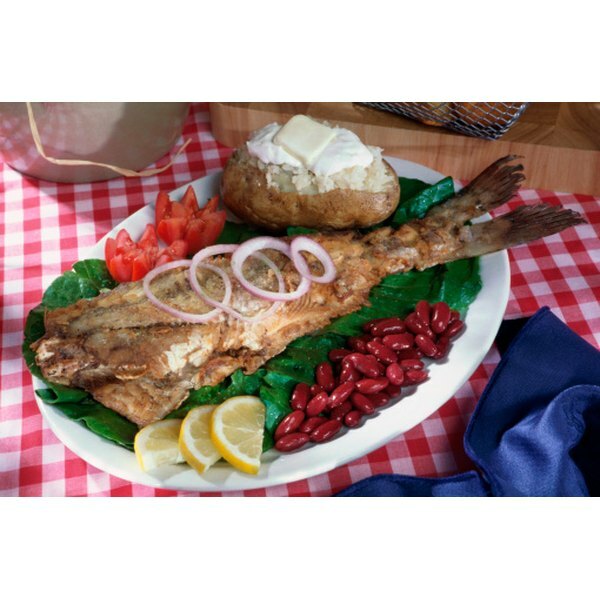 Simple to prepare at home, and affordable to purchase, cooking a bullhead fish creates a delicious meal. Rinse the fish under cool, running water and pat it dry with paper towels. Cut small slits in the sides of the catfish to accommodate the garlic. Insert the slices of garlic in the slits and place the remaining ones in the cavity of the fish. Lightly sprinkle inside and out with salt and pepper. Melt the butter in the skillet on medium-high heat. Place the fish in the skillet. Cover it with the lid and let it cook for four minutes. Flip the fish over, cover it again and cook it for another four minutes. Check the fish to see if it is done -- a fork flakes the meat when cooked. Other spices, herbs and seasonings can be added to the inside of the fish to add flavor. Serve the fish on rice or salads.